Considering how much we love enchiladas, it’s insane that we didn’t have a go-to enchilada sauce recipe on the blog. Obviously, that had to change. 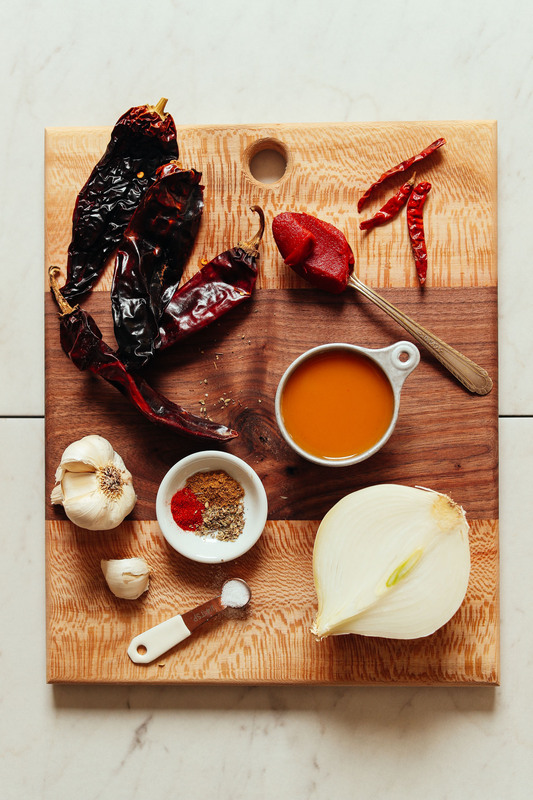 Meet your new best friend: saucy, spicy, red enchilada sauce ready in 30 minutes. Swoon! It’s so easy. Let us show you how. The base for this hearty sauce is sautéed onion and garlic and a mixture dried chilies. We went for New Mexico chilies, which are milder in spice, as well as chilies de arbol for a little more heat. This combination can be tweaked to increase or reduce heat as needed (see the recipe below + notes!). The peppers are cooked down and softened in some vegetable broth, and tomato paste, and a handful of spices bring it all together. This sauce is perfect for adding not only to your favorite enchilada recipe – like our Butternut Squash & Black Bean Enchiladas – but also to things like Quinoa Taco Meat or Tortilla Soup to bring more depth of flavor. Be sure to make a double batch so you can store leftovers in the freezer! For more Mexican-inspired recipes, check out these 14 Vegan Mexican-Inspired Recipes! If you try this sauce, let us know how it goes by writing a comment, leaving a rating, and tagging a photo #minimalistbaker on Instagram. Cheers, friends! 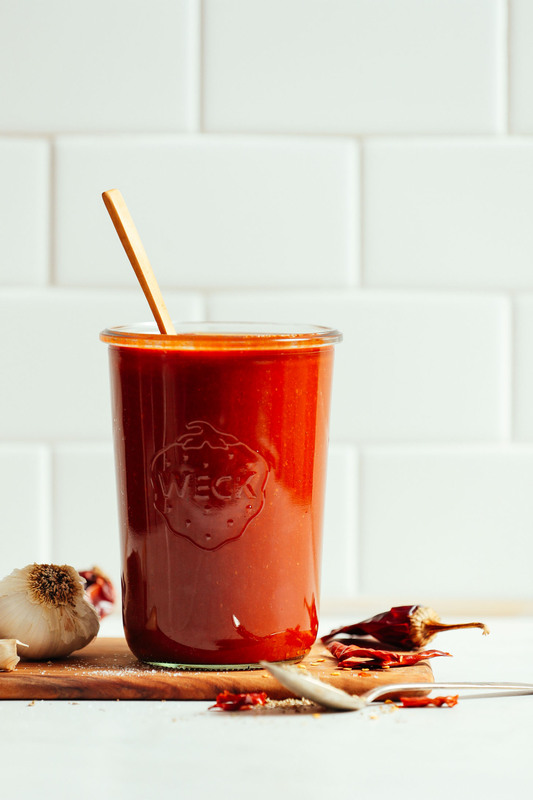 Smoky, rich, spicy red enchilada sauce made with simple ingredients and ready in 30 minutes. 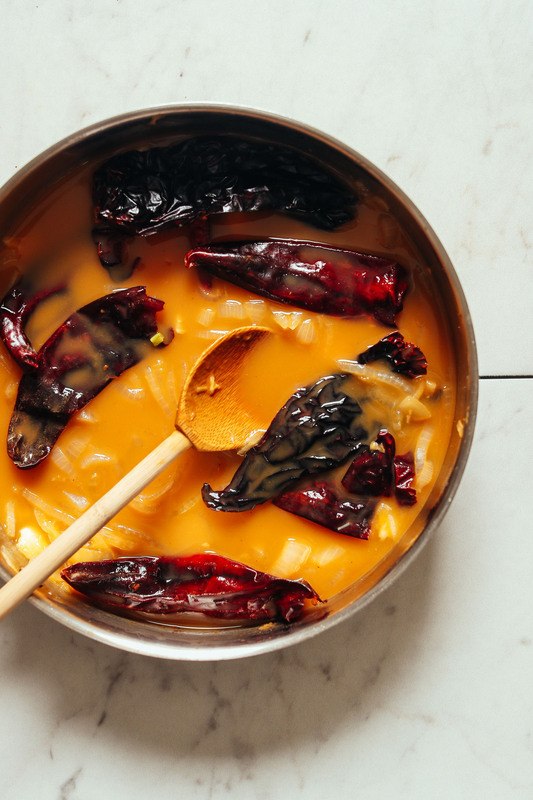 Perfect for taking your enchiladas to the next level. 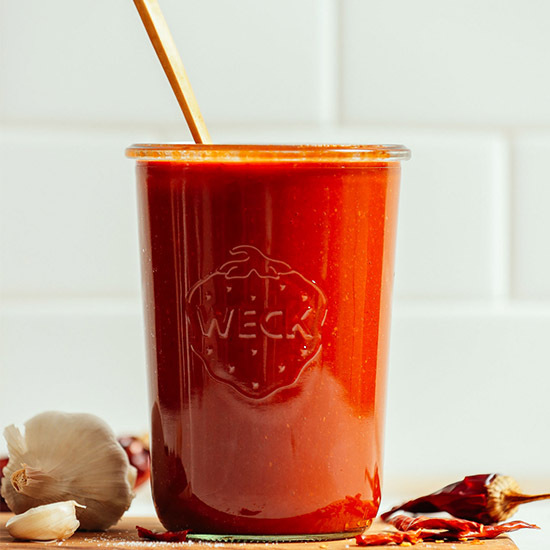 *In place of the arbol chilies, you can also sub 1 chipotle pepper in adobo sauce or 1/4 - 1/2 tsp cayenne pepper (per 2 arbol chilies) when blending for added spice. Omit if you don’t like spicy sauces. I made this for the black bean plantain enchiladas. I debated getting store-bought because this looked like so much work. SO. WORTH. IT. And I was able to save half and put it in the freezer for next time! First time making an enchilada sauce from scratch was a success thanks to this recipe! Super easy and tastes great! I did omit the arbor chilies as I was concerned about the sauce possibly being too spicy, and because I didn’t have any on hand. Without them the sauce is very mild. I plan on adding them next time I make this recipe. Yay! Thanks for sharing, Isabel! I love sauces from scratch and this one is easy and doesn’t disappoint. I use a mix of New Mexico Chiles and ancho and add a chipotle Chile when blending. I’ve made it a couple times and it’s my new go-to. If I use ancho powder instead of dried chili’s how much would I use? I made it with guajillo, ancho, New Mexico and árbol chiles. Thank you for recommending which to use. I seeded and stemmed because my daughter finds everything too spicy. This was still a little too spicy for her but it was fantastic. Unbelievably easy and vegan too. I had to make it in a flash since I didn’t tealize I was out of enchilada sauce and the specialty store I get good sauce from was too far for me to leave in the middle of cooking. Thanks for this. Really turned out nicely. Where do you find the dried chilies? We live in Vancouver … I’ve never looked for them, so I wasn’t sure if they are an easy item to find. Hi Anne Marie! Whole Foods should have them, otherwise I’d bet you could find some on Granville Island? Hope this helps! What kind of chilies would you recommend that are not spicy at all? Is that even possible? I love Mexican flavors but really can’t handle spice – so I’ve never cooked with chilies since I don’t know what’s spicy or not. But this recipe looks too good to pass up on! Made this last night and it was so easy and delicious! So, so much better than store-bought. I’m looking forward to trying again with different chillies and seeing how the flavour varies. I used 7 x dried guajillos and 1 x chipotle (from a can in adobo), and I used Vegeta as my veggie stock. I did find it was a bit too overpoweringly spicy (and I have a pretty high threshold) but I just put in a bit more tomato paste and about 100ml of cream and it fixed it right up. Definitely would make a double batch next time! This was so, so good and so easy. I’ll definitely be making it regularly. Fabulously easy to make, with brilliant results. I used some home made veggie broth, guajillo peppers, and left out the extra chillies. It was the perfect level of medium spicy for me. The texture is velvety and the sauce goes with everything- I tried it on millet burgers, on pierogis and on avocados. Super yum in all cases. Thanks for your wonderful and inspiring recipes! Wow! Thanks for sharing, Kay! Wow, I just made a crockpot chorizo black bean potato stew and it was missing something. Then I remembered I had about cup of your leftover enchilada sauce in the fridge. Bingo! It really added a depth of flavor that was missing. I love it when I can creatively use up bits and bobs in my fridge and appreciate when your recipes do the same. QUESTION – What measurements should the broth (or water) be divided into? I didnt seen and amount in the directions. Thanks. There’s no dividing those. It all added to the pot at once. What a zingy and spicy hawt sawce! I would love to try this with some onion broth I make at home by soaking onion skins in water. I really hope that it works out! Love your recipes – I don’t have access to dried chilli (or any fresh mild chilli) in the part of Australia that I live. Do you think I can use fresh capsicum/red pepper instead? I think so, but I haven’t tried it. I would recommend using a blend of fresh mild and spicy peppers. Nice Sauce! Sure love to have that. I used guajillo chilies but had no arbol. So for heat, I added one small can of el pato hot tomato sauce. Seriously, that stuff rocks, my Mexican neighbor turned me on to it. I also skipped the blender and transferred everything to a large mouthed mason jar and used my immersion blender. Really tasty and easy! 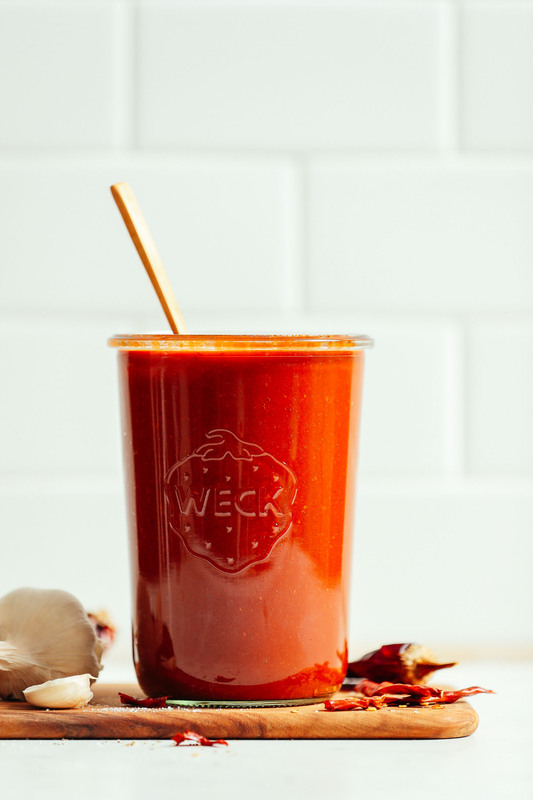 Friendly suggestion…try using vegetable stock (vegan), if your store offers it. It has a bit more flavor than the veggie broth. Allergic to tomatoes. Any suggestion for a replacement for the tomato paste? Hmm, what about carrot puree? Thanks! Should have thought of that, used to make a lentil loaf and used that with a little lemon juice for acidity. Followed the recipe with exception of chilies (used ancho instead of New Mexico). When I removed the stems, I also discarded much of the seeds in the ancho and arbol chilies. It resulted in a very smokey, rich, dark sauce that we will definitely make again. We topped the enchiladas with cilantro, avocado, lime juice and vegan sour cream. This looks and sounds AMAZING! Is there a way to use fresh chilies, or do they need to be dried? Hmm, I think there is a certain magic to the dried chilies. But if you try fresh let us know how it goes! Oh mamasita! As a newbie to Mexican food (and loving it! ), I’ve been looking for an easy, delicious red salsa for tacos and burritos for some time. My search is over!! When this arrived in my inbox, I knew I had to give it a try. So, I just made it and it is so easy and so delicious…I wish I would have followed your advice, Dana, and made a double batch! Having said that, the recipe as is makes a healthy amount of sauce. I did add a handful of cilantro to the blender at the end. A keeper of a recipe for sure! Muchas gracias, Dana!! You say the sauce is smokey… been vegan too long for me to do anything that is even vaguely smokey so which chilies should I use instead? Many thanks from South Africa. Hmm, really any mild dried chili you have access to should work. Thanks… we are going to the US for three months in three weeks so will check out the chilies there. Over here it is basically chili powder unless you go for fresh chilies. Have bookmarked this so I can make it when we are there :). I never realized how similar enchilada sauce is to a traditionally goan vindaloo. I usually make a paste and keep it in the freezer, then add to sauteed onion and garlic and add liquid. It’s great with rice when you need to make a grocery run but are already hungry. 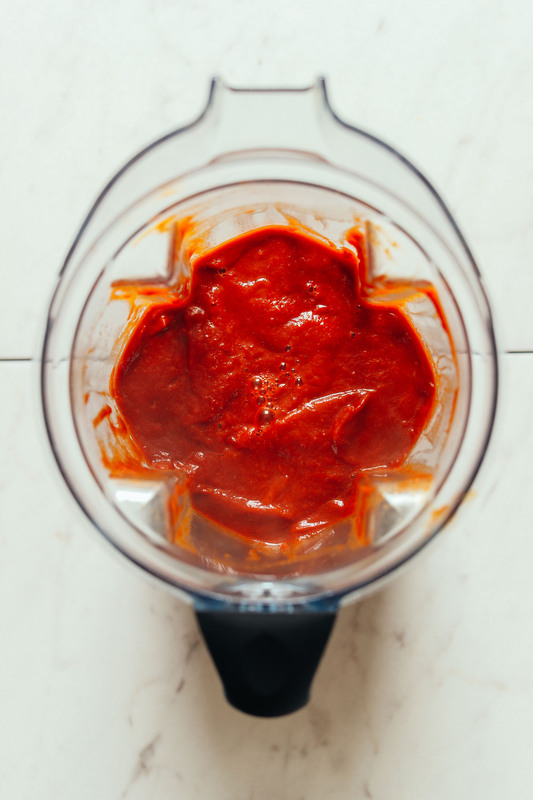 I immediately stopped scrolling when I say “easy” – I’ve made homemade enchilada sauce once before and never wanted to repeat that process to be honest. Done in 30 minutes is totally my style!